Great-sounding audio is one of the most important qualities of a video, especially when people are watching your videos on a small screen such as a mobile device or browser tab. That is why choosing the right type of microphone for video can really improve your video productions. For all of these microphone types, there are different kinds, meaning they will have different connections (XLR cable vs. USB) or microphone patterns (omnidirection or cardioid). 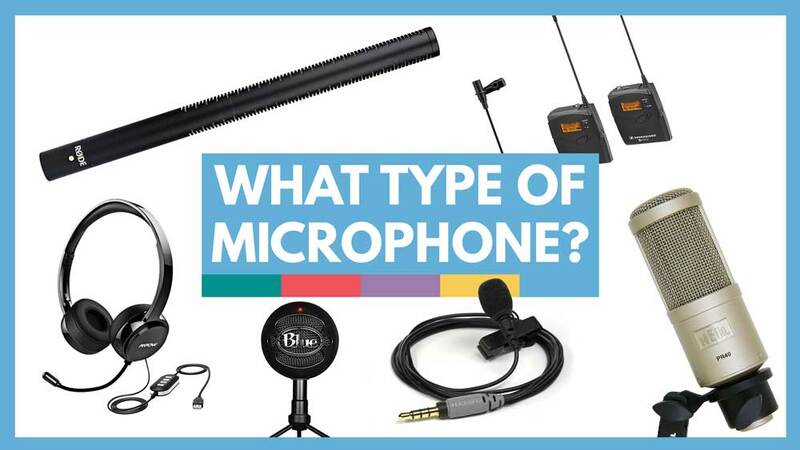 Here are some key definitions and things to know about microphones before we move on. This describes how a microphone is built and captures sound. Shure has a great article that breaks down the science between condenser and dynamic microphones, but in general dynamic microphones are less sensitive, simpler and more rugged, and does not need to be powered. A condenser microphone is more sensitive, needs to be powered by a battery or phantom power, and is less rugged. 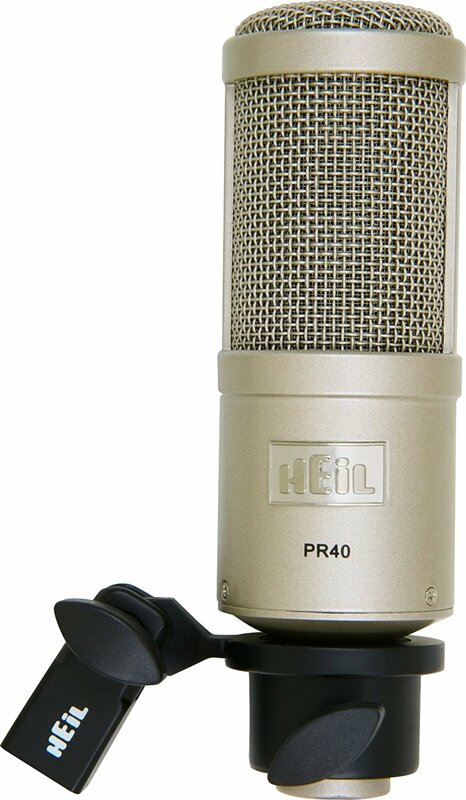 Dynamic microphones are generally less expensive than condenser microphones. The microphone pattern is the area that a microphone picks up sound from. You have three main categories – omni directional, cardioid, and bi directional. Omni-directional microphones pick up sounds from 360 degrees – meaning from every angle around the mic. Cardioid microphones have a more narrow range from 100-150 degrees, going from sub to regular to super to hyper directional. Bi-directional microphones pick up audio from two directions, 90 degrees each way. 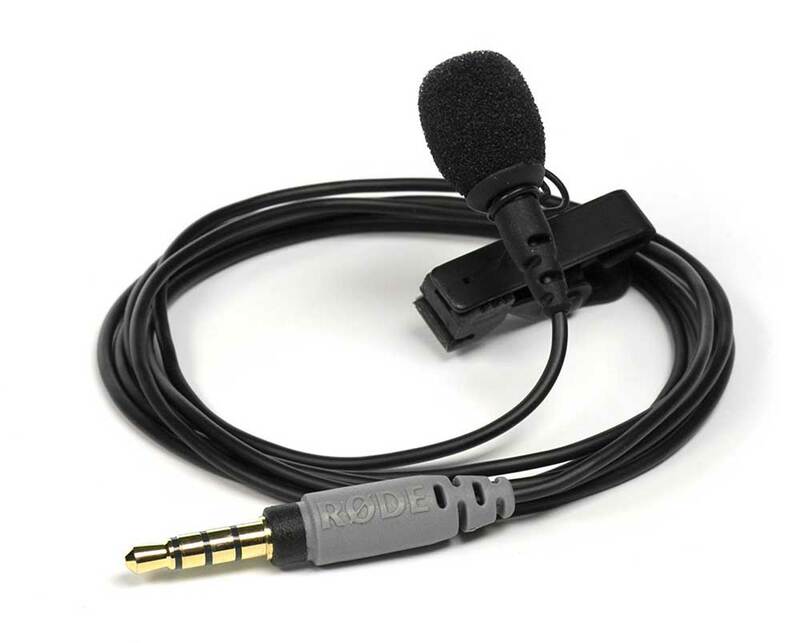 There are several microphone connectors, and depending on what camera you’re using or how you’re recording audio, you may need a specific type of microphone with a specific connector. The common connectors for video microphones are XLR, 3.5mm mini jack, and USB. What is phantom power? No, it has nothing to do with ghosts! Most condenser microphones need to be powered to capture sound. Phantom power is power from your camera or recording device supplied via the XLR cable. This means the microphone doesn’t need a battery to be powered, but can be powered by the camera itself. 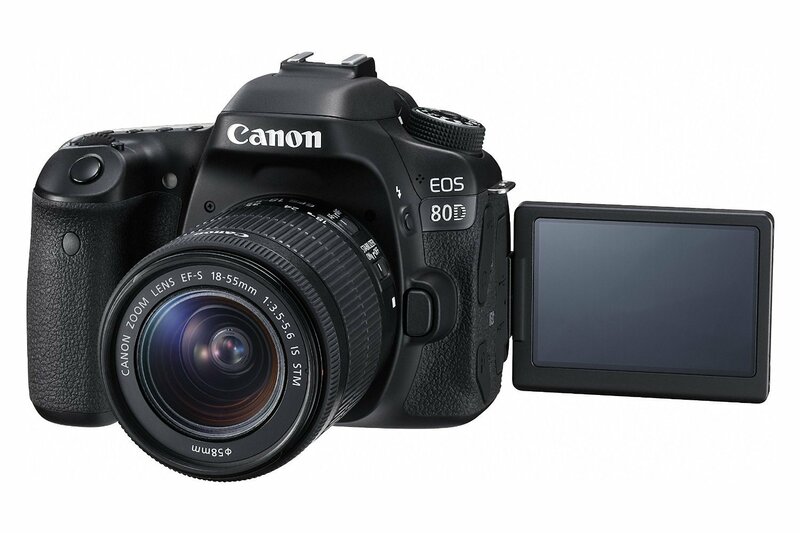 Now that we got that out of the way, let’s look at the different types of cameras and which we recommend. Also known as the lapel microphone or ‘lav’, the lavalier is a small microphone that can be clipped to the your shirt. These can be wired or wireless kits. Generally, they are omnidirectional or cardioid. The higher quality cardioid ones won’t pick up many noises other than the speaker, who is very close to the microphone. Lavalier microphones are great for talking head videos where the subject is moving around and you don’t have a boom operator to follow them around with a studio microphone. They’re also great for shooting extremely wide shots of an actor or subject when you can’t have a boom operator in the shot. Lapel mics are usually placed about 6-8 inches below the subject’s chin. They work best when not covered by clothing or anything that might muffle the sound. But if you want to make sure they are hidden, you are often able to clip them hidden between a button-up shirt, underneath a tie or scarf, or even taped to the inside of a shirt or jacket. We suggest lavalier microphones for documentary work, talking head videos when shooting by yourself (without someone to properly set up a shotgun mic), when filming multiple people at the same time who each have their own mic, and any video where the subject is moving around. A shotgun microphone, also known as a boom mic, is a long cylindrical microphone that is very directional. This means it won’t pick up as much background noise as most lavalier mics. The higher end shotgun microphones usually pick up more frequencies and sound better than comparable lav mics. Generally, these are placed just above, and sometimes below, the video frame pointed towards a subject’s chin – just in front of their mouth. A boom operator is necessary if the subject is moving around, as the directionality of a shotgun mic results in poor audio quality if the subject is turned even slightly away from the mic. The benefit of a shotgun microphone is that it is out of the frame, and won’t distract a viewer like a lav mic may. This is crucial for narrative films, where you wouldn’t want to see a lav mic. Setting up a shotgun microphone with a c-stand, boom pole, and boom pole holder is a great way to always have a microphone set up ready to record in your home office or DIY video studio. There are also on-board shotgun microphones that attach to the top of your camera. These are ideal for recording ambient sounds, such as during documentary or journalistic videos. It’s also great for on-the-fly interviews where you won’t have time to set up a lavalier microphone. Depending on the mic and how far the subject is away from the camera, this can sound even better than a lav mic. On-board shotgun microphones like the Rode VideoMic Pro are favorites of YouTube vloggers who film themselves at an arms distance. We recommend shotgun microphones for independent filmmaking, shooting in a video studio, and documentary and corporate videos. A studio microphone is one used in well just that… a studio! These are often used by radio hosts, podcasters, singers and musicians, voice over artists, and screencast and webinar creators. Studio microphones sound best when the subject is speaking directly into the mic, literally an inch or two away. This means that they aren’t great if you don’t want to see the microphone in the video frame. The quality of a studio microphone will be really high, with some of the best sounding audio you can capture. They capture a large range of frequencies. And they don’t capture a lot of background noise. There are many USB studio-style microphones that are great for recording directly into your computer. Studio microphones are great if you’re an online teacher recording screencast videos, a podcaster, or an aspiring radio broadcaster. We often see internet video creators using studio mics during livestreams and other online video content, with the microphone in the video frame. So it’s not a terrible thing if you want that high quality audio you get with a studio mic. 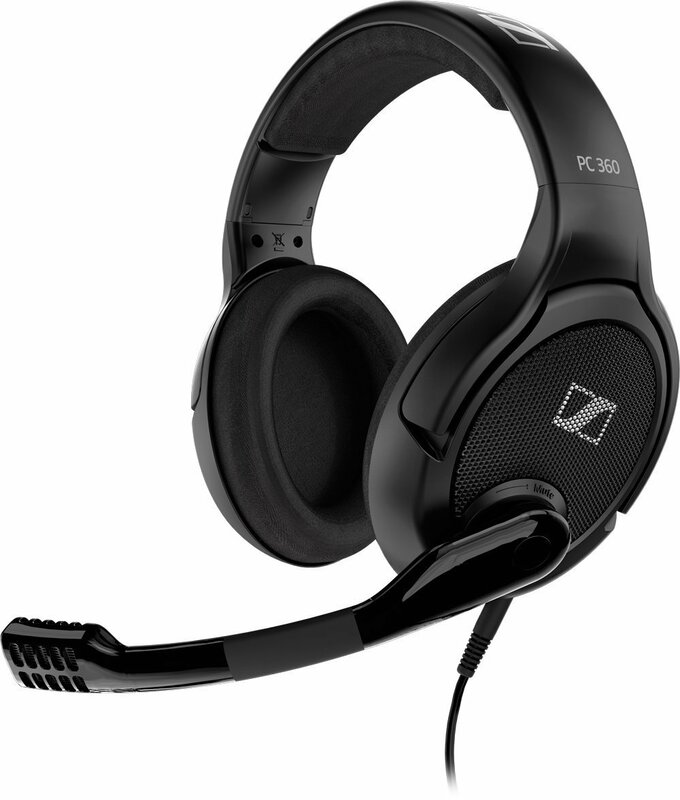 Our penultimate category of microphones is the headset microphone. This is anything from the microphone built into your Apple earbuds or a gaming headset for crushing some newbs! You’ll also see sports broadcasters use a headset microphone so they can easily hear any co-hosts they’re working with and also to prevent background noise of a crowd. They can also listen to the director for feedback while on the air. Headsets are great because you don’t have to worry about where you are facing or if you’re speaking directly into a microphone because it’s always right in front of your mouth. We recommend headsets for gamers, podcasters and doing live coverage of an event where you won’t be on camera the entire time. Finally, our last microphone is the internal one. This could be on your camera or even in your computer. Seriously, we don’t recommend using the internal camera’s mic for any reason other than as a reference for your higher quality audio. Perhaps you’re recording to a separate recording device like a Zoom H4N, and you need to sync your audio later. It’s best to have the scratch audio of the internal microphone. But if you’re doing anything professional, and need clean vocal audio, use one of our other recommendations. We hope that we’ve helped you decide which microphone type to use for your next video project. At the end of the day, you can use a lavalier, shotgun, studio or headset to record great audio. A lot has to do with recording in an environment that doesn’t have a lot of background noise or echo, and placing the microphone properly. We have several YouTube tutorials, articles and full courses on video production that can help you do just that if you’re interested! What are you using? Do you have any tips for improving your audio with different microphones? Share them in the comments below!